Carlton Hobbs Presents:Inspired by Antiquity – WHAT IS JAMES WEARING? James Andrew at Carlton Hobbs - photo by Matthew Dean. Last week I attended the opening of the monumental Carlton Hobbs exhibition Inspired by Antiquity: Classical influences on 18th and 19th Century furniture and works of art. The exhibition highlights the largest collection of Thomas Hope furniture to be offered for sale in nearly a century. As some of you may know, the fabulously successful British banker, Thomas Hope, was a connoisseur, collector, and designer, whose classically inspired design ideas helped to form the Regency taste. A visit to the Hobbs gallery is always an enlightening experience thanks to the exhaustive research they perform on all of the pieces they show; for this latest exhibition, Carlton Hobbs and Stefanie Rinza consulted with museum curators and highly regarded experts in the fields of antiquities and decorative arts to help identify the ancient design sources of the pieces and to interpret the symbolism of the decorative devices used. 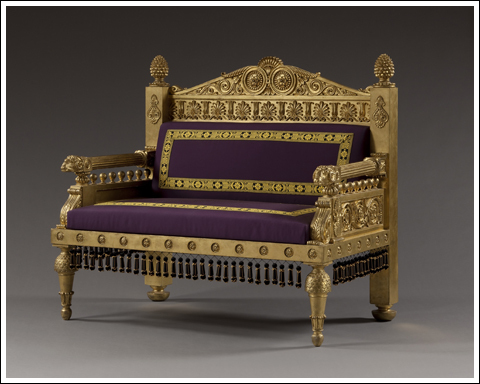 Inspired by Antiquity: Classical influences on 18th and 19th Century furniture and works of art. is on view January 20th through February 18th, 2011. Do visit Carlton Hobbs to view this truly remarkable and historically significant collection. I’ve included below just a glimpse of some of the most sensational pieces from the exhibition. Enjoy! The Duchess Street Settee after a Design by Thomas Hope. English, Circa 1802. 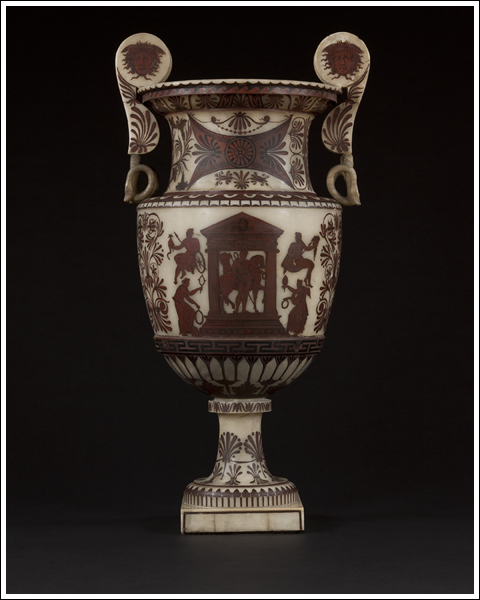 Monumental White Alabaster Vase with Etruscan style painted decoration. Probably Rome, early 19th century. The Harewood House Torchères. 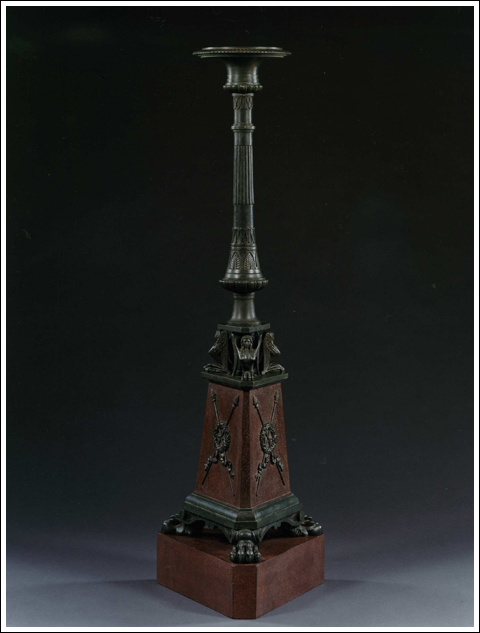 Pair of Carved Faux Bronze and Porphyry Torchères possibly by Thomas Chippendale the Younger. English, Circa 1815. Dressed for the beyond fabulous opening at Carlton Hobbs, I’m sporting an aubergine silk velvet jacket, wool checked pants in browns and purples, python belt with silver double horsehead buckle and a purple silk paisley skinny scarf all by Gucci, Turnbull and Asser purple cotton shirt with contrast white collar and cuffs, vintage moon stone cuff links, Tom Ford saddle leather loafers and brown and lavender silk polka dot pocket square, my fragrance is Creed Imperial Millesime. Photo by Matthew Dean. Posted in: Carlton Hobbs, Creed, Gucci, Random, Tom Ford, Turnbull and Asser. Amazing pictures. They remind me of Hopetown House in Scotland. I visited it near Edimborough. This year we have an exhibition at the Louvre about the influence of Antiquity on 18th Century artists, called “l’Antiquité rêvée”. It will last until February 14th. One of your best posts ever! You look so styled here, very London sixties, and I enjoyed the aspirational flavour of this writing and the beyond gorgeous classic images from Carlton Hobbs! Pure genius! Keep it up! Btw, have you seen the blog called The Devoted Classicist – by our friend John Tackett. As always,Thank You for your marvelous support! 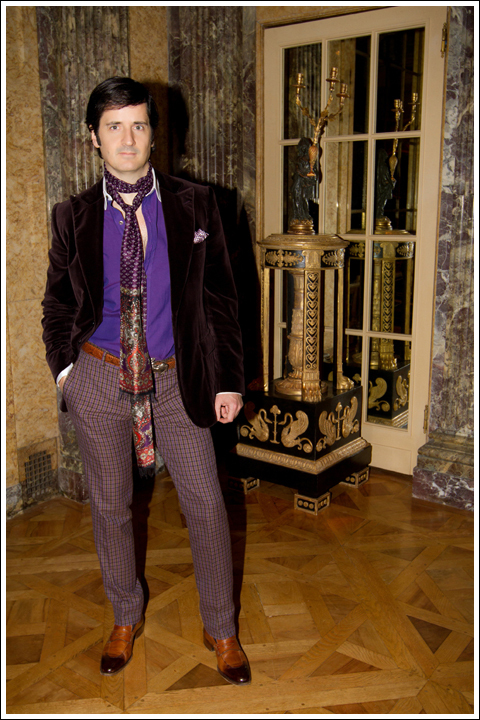 i love the purple shirt with the other colors of your clothes and the scarf is an amazing addition to the look. Dean, you took the words right out of my mouth–perfection 60s, and oh, purple passion…! JA…the pose, the lighting, the background, sheer perfection! Thank You grey hustle and Margaret! I adore ALL your fantastic feedback.